I am releasing today the first update for ScribeUI for Google Summer of Code 2015. I had three main objectives planned for this summer, which you can see in this previous blog post. This update contains the first part of the project, improved error detection. You can try it here! When the map renders pink error tiles, an error message appears over it with a link to open the logs if they’re not already open. In the logs, there are two links: one to the location of the error in the result mapfile, and one to the location of the error in the editor. These links are available only when the error returned by mapserver contains the line number. Sometimes the error can’t be located in the editor, often because of the differences between the Scribe syntax and the regular mapfile syntax. When that happens, you should still be able to find it in the result tab. The Debug tab now contains the output of shp2img with debug level 5 using the generated mapfile as the input. 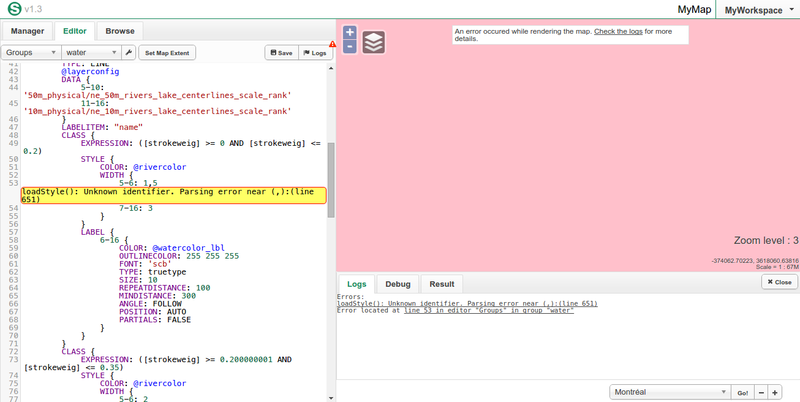 The logs generated by shp2img are very useful for debugging. The Result tab was also upgraded to a read-only CodeMirror editor, allowing syntax highlighting, error widgets and line numbering. The second feature planned is exporting and importing maps and workspaces. This would allow users to share their maps more easily, and it would make it possible to add backups.